Located in Klamath Falls OR, 12 miles from the California boarder and 85 miles east of Medford, OR. ---- From SR-140, take exit 3 (Washburn Way) head south to Joe Wright Road (first stop sign). Turn left onto Joe Wright Road, cross the railroad tracks and turn right on Airport Way. ---- From US-97, take Joe Wright Road East. Go about 2.3 miles, cross the railroad tracks and turn right on Airport Way. 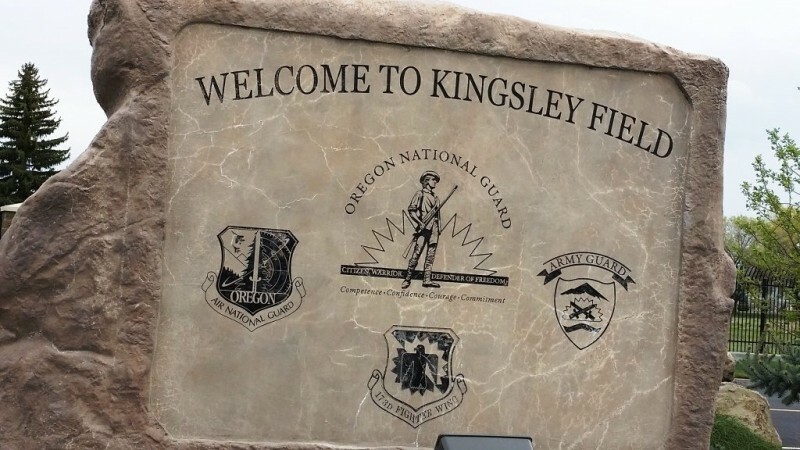 ---- ALL: After turning onto Airport Way, immediately look for the Kingsley Field Monument Marker and veer right into the Main Gate. 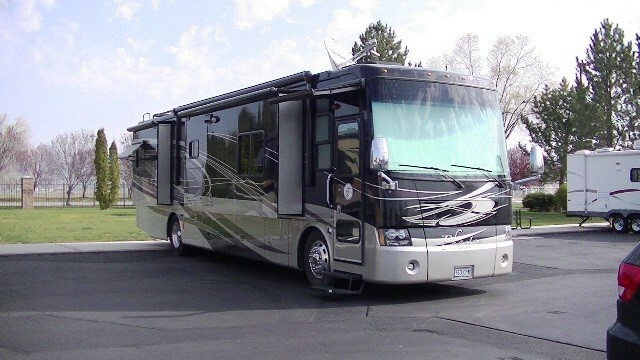 Stay in the right lane for large RV's. Once past the gate stay on McConnell Circle to the stop sign. Turn left onto Arnold Ave. Go to the end, which is Gentile St. The RV Park is on the left. Pets must be on a leash at all times. Be sure to clean up after your pet. Do not tie up to trees, leave them unattended, or allow disruption of your neighbors. If staying over 14 days, approval must be obtained through SPTG/CCE, (541) 885-6198. No RV or car washing is allowed. 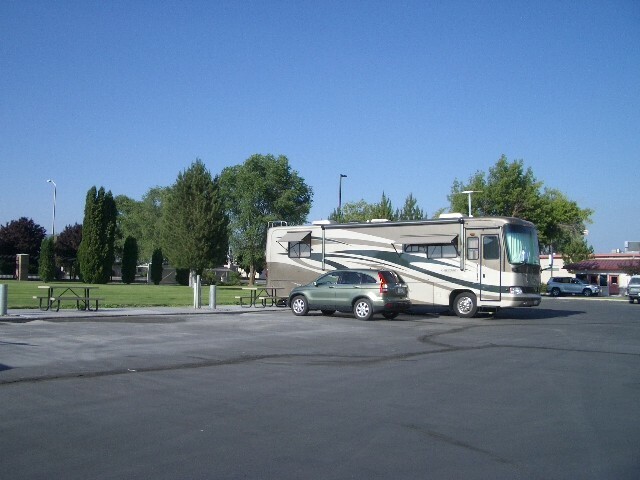 RV Park is back-in sites in an auto parking lot. 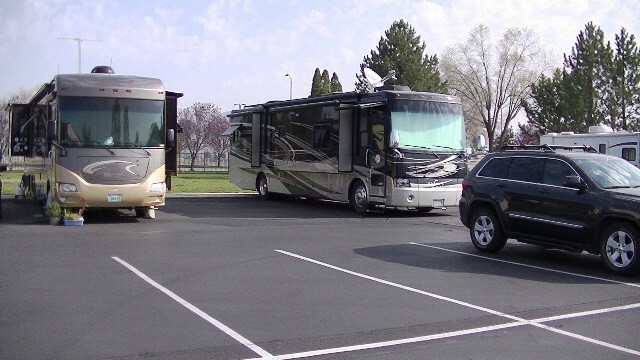 If the parking lot is busy/full, backing in large RV's can be difficult. Luckily, the parking lot isn't used much. 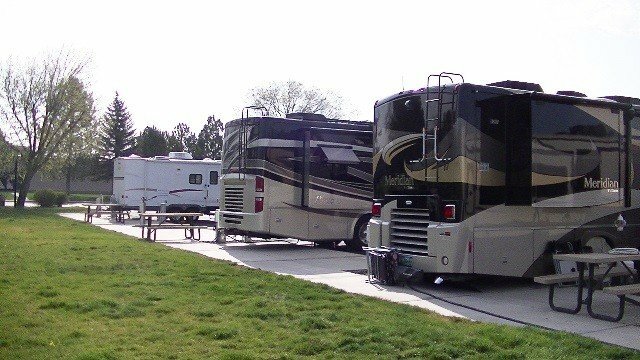 RV sites are lined up along the back of the parking lot, with a grass area behind. This is a great place to base out of to see the local attractions. Planned to spend a couple days here, but when we arrived, the campground was full. The gate guards had to move some metal barriers for use to get through the right (truck) lane. No problems getting to the campground. It wasn't obvious that anyone staying there was homesteading. One site was taken by a tent, who was using the electric. Oh well, we moved on to a casino nearby. We knew it was a gamble trying to stop here. Beautiful and scenic drive here. We came in from the east. Poorly managed site with little to no oversight! At least 3 of the five sites have what appear to be full time residents LIVING there. On this visit, 4 of the 5 spots were occupied by RVs and the 5th site had a car parked in it from 12-14 May; after contacting the other RV owners, they stated that the 5th RESIDENT had left for the weekend and apparently considers this spot his/her private lot...so much for first come, first serve, no reservations! I would not waste my time driving by this site for a short stay or even to look. Additionally, the lot is near the Security Forces vehicle lot and is extremely noisy from about 0500 on, not to mention the multiple trains, loose dogs and other vehicle traffic. My wife is doing a temporary full-time stint at Kingsley, so we decided to save money on room rentals. It isn't bad for what it is, a parking lot with hookups and a picnic table. It is very quiet at night, and the town is just minutes away. This time of year is frigid, so keep that in mind if you come in the winter! The spots are right next to the gym, but the men's showers are being renovated at this time (toilets are still available). No big deal for us as we have a shower in the trailer. The new development over what other reviewers mentioned is that there is now a pay station at the site, so you do not have to go back and pay at the front gate. Was driving through the area and pulled in to stay the night. Just like the page said. check in was easy. very friendly people. Large parking lot so backing was easy. stayed 2 nights, was very nice. Droped off envelope to the gate on the way out. Ill be back. The picture says it all. 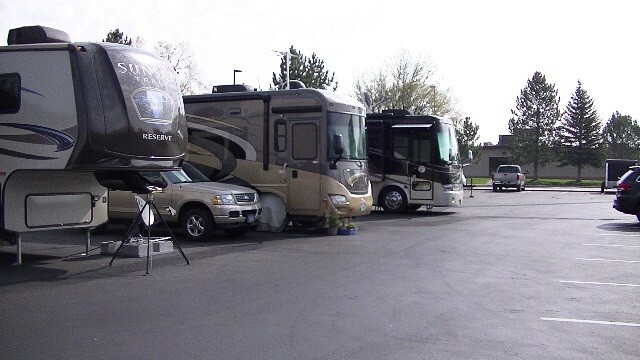 A very nice parking lot with five 30-amp hook ups. Check in at the gate easy. They will give you a key that goes to nothing. You park your rig and take your key back to the SP on the gate. They will give you an envelope for your fees. Drop off fee whenever you'd like at the gate, no urgency. Jets take off at 0915 every morning. You'll hear a few trains go by. Very quiet nights. Feel free to use the gym & showers open 24 hrs. No public laundry in base. Town is 5 minutes. Small BX and Class VI, M-F, closes at 1630. Barbershop too. Base is very busy during the day but after 1630, ghost town. Except for gym. Small location with no bells and whistles. Nice to have a safe location with full hookups available at a reasonable rate. Not much at the base, but convenient to town. Will stay again when in the area. This is one of those small hidden gems that you need to put on your list if you are in Southern Oregon. It is a parking lot with five sites. 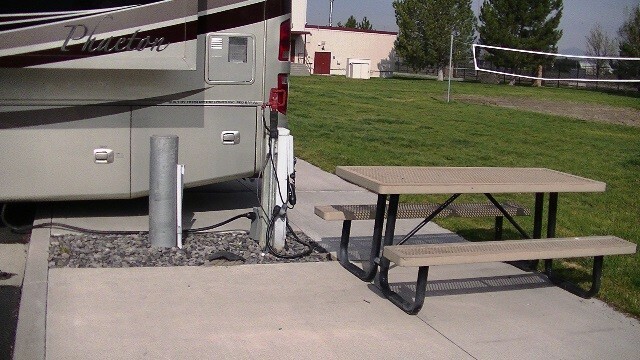 It is a clean, quiet, secure parking lot with five clean, wide, full hookup sites. It is a place that I will put on my list to return to each time that I am in the area. We were here for one night on the weekend. We have never been on a base that was this quiet. It was great, so peaceful. What few amenities that they have were not open. The price now is 15 dollars a night and it is on a parking lot. The base was very well maintained. It could have been because of Government shut down that it was so quiet. Would stay here again. We stopped here to get a break from the heat after visiting Crater Lake. 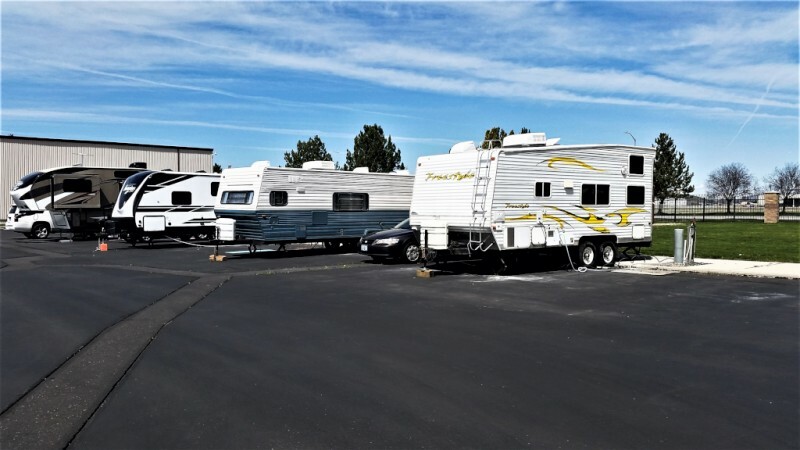 The Kingsley Kampground is located right next to the Klamath Falls Airport. Take exit 3 (Washburn Way) off of highway 140 and head south to Joe Wright Road (first stop sign). Turn left onto Joe Wright Road, cross the railroad tracks and turn right on Airport Way. Immediately look for the Kingsley Field Monument Marker and veer right into the Main Gate. Ask the gate guard for an RV envelope and direction to the campground. After finding a site (only 5 of them), return (easy walk) to the Main Gate to drop off your payment (currently $12). Washers and dryers are located in the transient barracks across from the campground and are free. No WIFI at this installation, but you can drive down to the airport and get free WIFI in the terminal. Parking there is free. The gym is located next to the campground where you can use the shower and bathroom facilities. Very clean! The gym is also open 24 hours. Small shoppette closes at 1630 on weekdays and closed on the weekends. No washing of RVs/vehicles allowed. There is also a dump station. I have been staying here for awhile now; am stationed here in the ANG. While not having much in the way of facilities, it is very safe, clean, and convenient to town, where you can find more facilities, such as WalMart, and plenty of food stops. For a small town, Klamath Falls has pretty much all that you will NEED. The CG does have a dump station, and the price is definitely GREAT at $12/night. 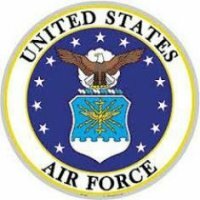 It is very quiet on base, even during duty hours, and when the jets are flying. Access to Gym is a huge plus; 24 hours, restrooms and showers, and right next door! The Gym showers are nice and HOT with good spray pressure. The only minor inconvenience I have found is the abundance of mosquitoes during warm weather; sprinklers come on twice a day near the Gym/CG. Make sure that you have a water pressure regulator, because the pressure is quite high. When you are parked in the CG, sunrise (flightline side) and sunset (Gym side) are directly to the sides of your rig, and the sun is quite bright coming in the windows! We camped here while visiting Crater Lake and touring the general area. Getting to the Guard Base was easy and the security personnel on the gate were very helpful. We were there over a long military weekend break, so we didn't see a lot going on at the base. No base facilities were open, other than the gym. 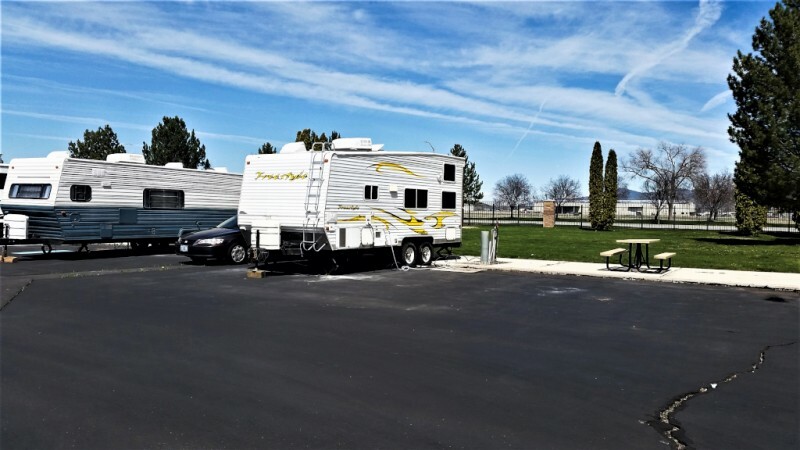 The CG may not have a lot of amenities, but the RV sites were clean, quiet and convenient for the areas that we wanted to tour. I can’t complain about a Guard Base CG that is available out in the middle of no-where. Hey, I used to be stationed at Point Arena. Not many Guard Bases offer CG’s. Thanks. Had to give this place all three's. I just stayed the one night and only hooked up electric. 30 amp. there is water and sewer available. The "campground" is a parking lot. There are 5 spaces that you back into. The hookups are along a curb that you back to. 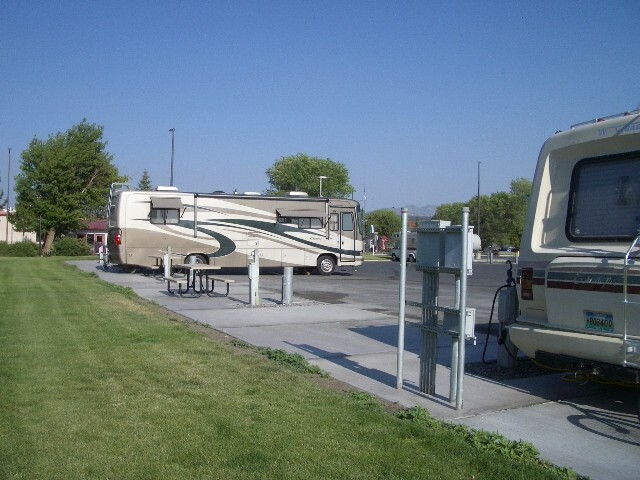 When you enter through the main gate, you should ask for an envelope and copy of the rules for the RV Park. The envelope is to put your payment in, then return it to the main gate. I did not unhook the trailer so just dropped the payment off on my way out in the morning. Everyone I came in contact was very friendly and helpful. It might be a good place to stay if you are exploring the area, but it is not a destination campground. 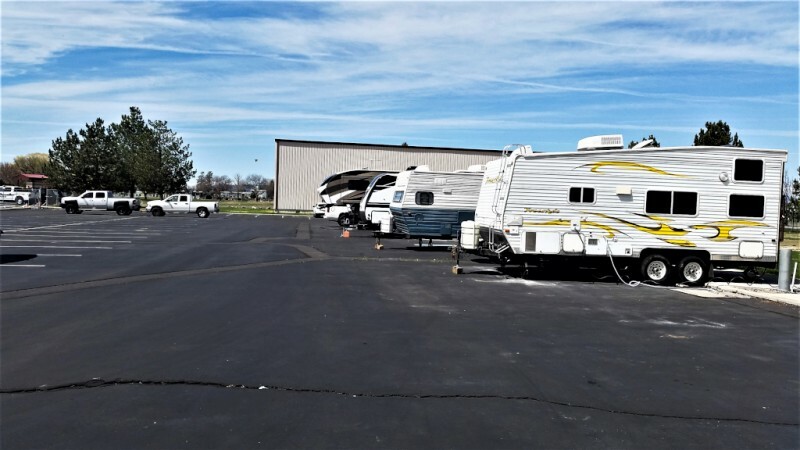 The RV spots are directly next to the 24hr gym (B-ball court, R-Ball, weight room, cardio, locker rooms with clean showers). The current main gate is changing it's physical location sometime in 2009. The shoppette is open only during duty hours but has the usual convenience items and Class VI. Barber Shop and Bank are also next to the shoppette. There is a "club" located in the dining facility (chow hall) directly across from the RV lots. It is open Thursday and Friday nights. No food but good prices on drinks and good conversation. I highly recommend Wubba's BBQ located in town (plenty O RV parking there) but no eat in...there are picnic tables outside though. Great little out of the way place to stay. Very small base, with few amenities. BX sort of a small 'shoppette'. camp sites are level and paved. All hookups 110vac/w/s. Showers and restrooms available in the gym. Convenient stopping off place going north or south. Convenient to Crater Lake NP. Amenities though sparse are adequate. Transactions such as site payment are made with the gate guard, who I found to be quite an interesting conversationalist between tending to his duties. This is an ANG base with 5 FHU spots. They are located immediately adjacent to the main gate. The main gate has the usual zig-zag pattern of bollards but we had no trouble getting our 37' motorhome with toad through. Gate guard gives you an envelope for registration and collects the money. Spaces are clean and level. 30 amp service. Other than the base gym there are no amenities here. The base was pretty quiet when we were there - a few people moving about. We just wanted a clean, safe place with utilities to spend the night and this was perfect. If you want more - go somewhere else. Price was still $12 a day. Directions: The base entrance is just before the commercial air terminal. If you follow the signs for the air terminal you will go right past the well marked entrance. Wow can't believe no one else has written a review since last June and again it was me. Well a change in the park finds all 5 spaces now have sewer hookups and concrete patio's behind parking spots. To avoid water spots be careful not to back the tail of your rig over the curb, the sprinkler system is set to come on at night and is real hard water. The Campground is a simple little park with great showers at the Base Gym, still a good value at $12.00 a day and no increase with the latest improvements. Small BX, no commissary or BX service station. Very well kept installation, campground is just inside the front gate. Five spaces located on the side of an asphalt parking lot. W/E only with a dump station close by. 30 amp service only. Everyone including the security guards have all been super nice and informative. This is a great place to base out of to see the local attractions. Big rig friendly. I would stay here again.